Vomiting in Cats: It’s not Just Hairballs ! What goes Squish in the night? It may be a hairball, but it’s probably a sign of something more serious! 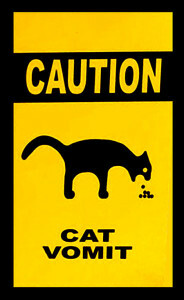 Cats will vomit whatever happens to be in their stomachs when they are nauseated. If that happens to be hair, they will vomit a hairball. But that is not necessarily the primary reason for the nausea! Does your cat vomit whole food or right after eating? This sound like “Scarf ‘n’ Barf”– eating too much too fast! If limiting your cat’s meals to 1/4 cup of food and feeding in a BrakeFast Bowl doesn’t solve the problem, there is probably a medical problem. 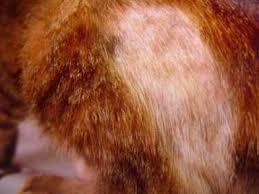 Do you notice your cat grooming excessively, missing or broken hairs? Cats will lick themselves excessively due to itchiness from allergies, fungal infections or parasites such as mites or fleas. Ingestion of hair, when it is excessive cn cause enough irritation to the stomach to cause vomiting. Your cat may have Delayed Gastric Emptying. A delay in the emptying time of the stomach allows the hair to sit in the stomach long enough to cause irritation. This could also be a clue to constipation issues. Often vomiting is the only symptom in cats with food hypersensitivities and IBD. Your veterinarian can prescribe an Anallerenic or Hydrolyzed Protein Diet trial to check for these problems. Pancreatitis, diabetes, thyroid disease, kidney and liver conditions can all cause vomiting of fluid, food, hair, or whatever may happen to be in the stomach at the time nausea strikes. Does your cat frequent the litterbox, vomit after being in the litterbox or straining to eliminate in appropriate locations? Bladder pain (infection, bladder stones, inflammation) and constipation can both make cats vomit because of the severe discomfort. It’s improtant to remember that Cats are masters of hiding their illnesses! Being unique among species as both a prey and predator, it is very important that they show no weakness. So ANY time a cat shows you any sign of illness, including vomiting—even “just hairballs”, it’s important to have it checked it out! chances are, there is something that your veterinarian can recommend to minimize finding those squishy surprises in the middle of the night!